Below is a 5-question test on finding the hypotenuse using Pythagoras theorem. This test is linked to the lesson on finding the hypotenuse using Pythagoras theorem, which also has a test. Finding a shorter side using Pythagoras' theorem What is Pythagoras' theorem? Who was Pythagoras? What is a right triangle? 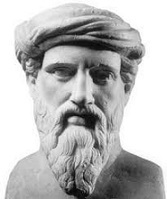 Pythagoras was an ancient Greek philosopher, mathematician and founder of a religious movement, who lived from about 570 - 495 BC. His most famous contribution is Pythagoras' theorem. He started a religious movement, whose followers called themselves Pythagoreans. They believed numbers were behind all things, giving them mystic importance. They also believed in the transmigration of souls - that a person's soul would move to another person, animal or vegetable after they died.